Cream cheese. Creamy desserts. Cheesecake. Frostings. Fruity concoctions with mounds of creamy goodness. Peanut butter, chocolate, and nuts, oh my! Those could be tags for the first mix that I am creating a Healthy Mix e-book for: Cream Cheese Dessert Base. I have been busily testing recipes for this e-book (and eating the goodies!) for months now. While the entire e-book is not ready yet, I will share with you some of the deliciousness that it contains to get you started in creating desserts from this amazing dessert base. One of the true delights of low carb cooking (if you are not lactose intolerant or following some other non-dairy plan) has got to be cream cheese. While I was never one to eat cream cheese and bagels (too bland for me—I like sweet! ), I have grown to love cream cheese in many other ways (sweet and savory) in my low carb and healthy cooking and baking. As a matter of fact, I have loved it so much that I developed this base that uses cream cheese as the foundation for many desserts. I found that if I make this and have it in my refrigerator (or freezer) at all times, I am less prone to wander from my healthful eating path. Need chocolate—chocolate chips and pecans stirred into Cream Cheese Whip (what I call it when I add whipping cream or, gasp, Cool Whip or Readi Whip, to the base) makes an amazing chocolate fix treat. Need something that really doesn’t taste healthy at all—something that makes you feel like you are at your favorite Christmas gathering and eating “Sherry’s Cherries” as a friend likes to call Cherry Delight? Need a baked dessert? This mix is the star of an amazing baked cheese cake dessert as well as a couple of cream pies that are out of this world (and nobody would guess they are healthy!). Want something absolutely decadent? Use a homemade healthy pudding or a sugar-free boxed mix to make amazing desserts with this base—pudding, base, whipping cream, and ____ (fill in the blank….fruit, chocolate chips, nuts, cookie crust, coconut, peanut butter, or all of the above!). Want to make something for dessert so that the kids will quit saying you never let them have dessert—this base is sugar-free (with healthful substitutions for sugar) and actually has some good stuff (protein and vitamins)! And trust me, your kids will never EVER guess that it isn’t “bad” for you. 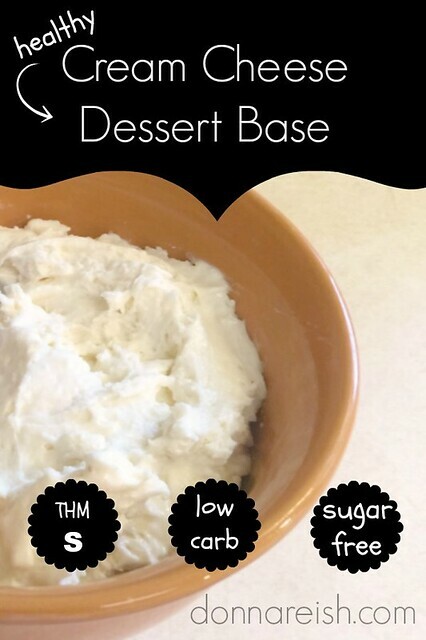 Want some frosting for those low carb cupcakes or healthful cake—Cream Cheese Dessert Base is the beginning of many frosting recipes. Any time you use a mix, you have a head start on recipes. This is why people use cake mixes, brownie mixes, cream cheese herb mixes, seasoning packets, and more. . I have been a freezer cook/make ahead cook/mix cook for over twenty-five years (with healthful versions in recent years). While the Cream Cheese Dessert Base only has a handful of ingredients in it, using it will often cut out half of the work/steps involved in making desserts. Additionally, you are doing all of the “whipping” of the cream cheese, liquid, sweetener, and vanilla ahead of time. Thus, your dessert base is already whipped thoroughly. Most of the time, you can just add your next ingredients by hand quickly. See why I like to keep it around so much!? The base recipe is given first—followed by recipes galore using it coming here and in the e-book (“Healthy Mixes and Fast Fixes: Cream Cheese Dessert Base). Following the base recipe, the Recipe Labels are given to help you utilize this mix in many situations. The Recipe Labels for the base are lengthy in order to set you up for success in using all of the recipes using this mix. (The Recipe Labels following each individual recipe will not be as lengthy and detailed as the first one following the base recipe. Whip all of the cream cheese in the Kitchen Aid or other with whisk beater (or use hand mixer in large mixing bowl). Gradually beat in the bulk powdered sweetener until all is incorporated, starting with the smaller amount and tasting to see if you want to add more. (I like to use the least amount and no liquid until I use it in recipes. Then if I add peanut flour or chocolate chips or whipping cream or whatever, I can adjust to the thickness and sweetness I desire. Each “part” will be approximately 2 ¼ to 2½ cups. This is the increment that the recipes call for that use this base. Follow instructions given for full recipe above. Very Low Carb (VLC): This is a very low carb recipe, dependent, of course, upon the choice of sweetener. Also note that different brands of cream cheese can have zero or one carb per serving (and different levels of “fat”—1/3 less and no-fat varieties also have more carbs than the full fat version). If you want super low carb, look for zero or one carb per serving full fat cream cheese and a sweetener with a zero net or nearly zero net carbs after subtracting fiber and/or sugar alcohols. Family-Friendly (FF): This is a super family-friendly starter because most people cannot even tell it is low carb/healthier than, say, cherry delight made with sugar (one of the recipes that uses this base). It also uses less sugar-free substitute per “part” than other sugar-free dessert recipes. This makes it a good starter recipe for those who want to begin cooking and baking with healthy sugar substitutes as it will cause less tummy troubles for those trying to adjust to sugar-free sweeteners. Store-Bought-Stella (SBS): Store-Bought-Stellas are in business with this one—the ease of store-bought products with the taste of homemade. 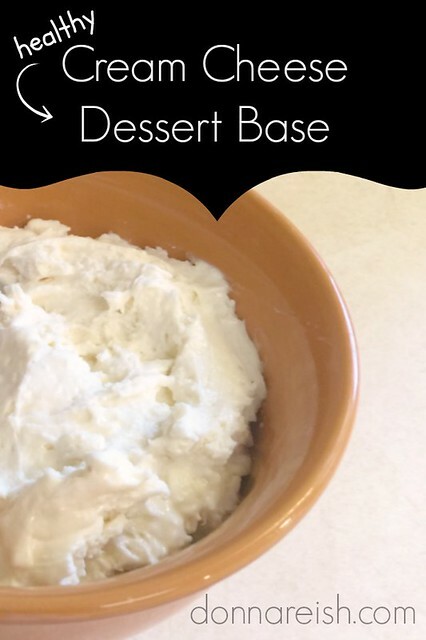 Once you whip up the base, you can make all of the dishes fairly easily—use Cool Whip rather than your own whipping cream to make a dip or filling. Use canned sugar-free fruit filling rather than cleaning and sweetening your own strawberries, etc. Sugar-free chocolate chips and pecans stirred into the base makes a chocolate-pecan cheesecake whip that is super yummy. This base takes fifteen minutes to whip up—and can be used with other store-bought items to make quick treats. Homemade Hannah (HH): Likewise, Homemade Hannah’s can be as homemade as they wanna be! 🙂 Use fresh fruit, whipped whipping cream, homemade nut crusts…go for it! This base, as well as the many recipes that go along with it, can be a Homemade Hannah’s delight as she experiments with all kinds of yummy desserts using it. Freezer Cooking (FC): This base can be stored in the freezer, if desired. Sometimes the texture of cream cheese changes after freezing, but I have noticed it a lot less once it is mixed with the sweetener into the “base.” I have kept mine in the freezer without any problems. However, because I like to have it on hand to use easily (and defrosting it in the microwave or under hot water doesn’t work well)—and because it keeps well in the refrigerator—I seldom freeze it. Trim Healthy Mama-Friendly (THM) (www.trimhealthymama.com): This can be made as an S or an E (for the base itself—adding whipping cream to it for a filling makes it an S for sure). If you use full fat cream cheese, the base is an S. If you use fat free, it can be an E or a FP. The recipes made with the base itself are pretty much all S (frosting with butter, cherry delight with whipping cream, etc.). Exceptions to this are ones that creative THM’s make with fat free cream cheese and use peanut flour, flavorings, fruit, etc., to make lower fat desserts and whips that would result in an E treat. You can learn more about how to do this in the key following each recipe. Note: I do not recommend using the fat free cream cheese (or even the 1/3 less fat version alone) if you are going to use the base for frostings or baked cheesecake types of recipes. 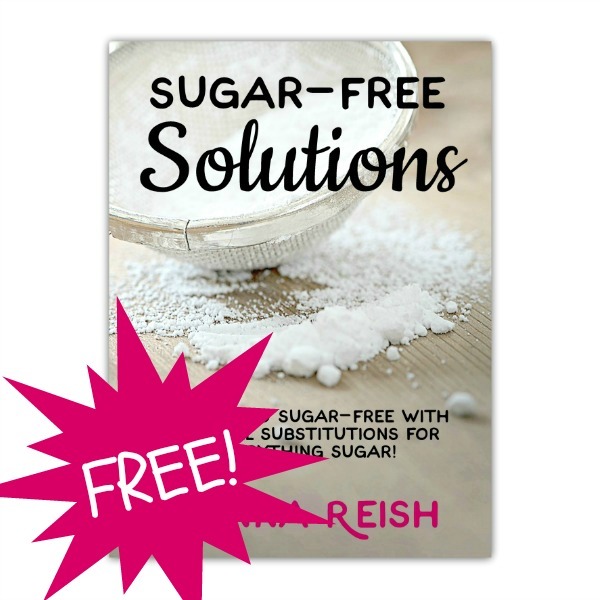 Sugar Free (SF): This can be completely sugar-free depending on which bulk sweetener you use. Imagine icing/frosting or cherry delight or whipped no-bake cheesecake where you don’t feel miserable from the sugar/carbs afterwards! It is a thing of beauty!